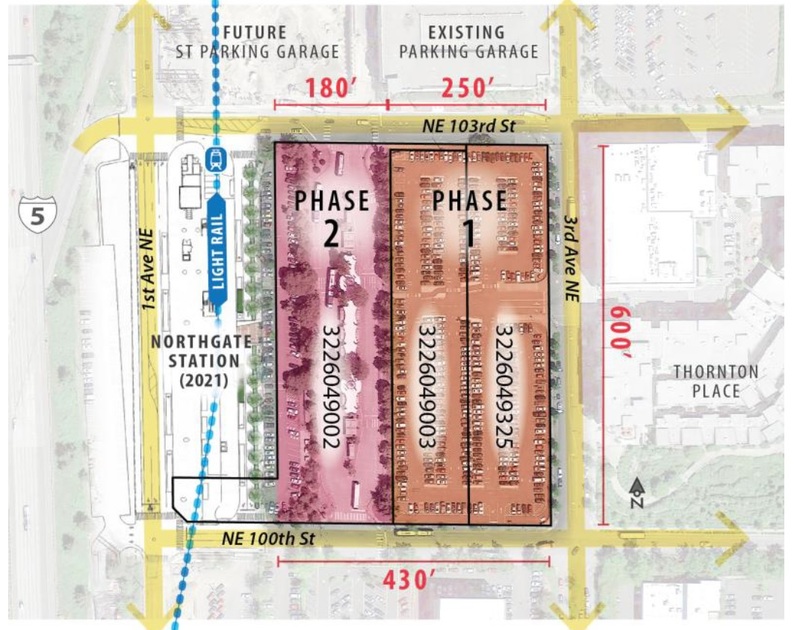 The Northgate TOD project has been in the works since 2012 when the Northgate Link light rail extension was approved. In 2016, Seattle Mayor Ed Murray and Constantine announced that the city and the county would each be contributing $10 million towards the project, in the form of loan funding to build at least 200 affordable housing units. The original timeline called for soliciting a developer and signing a letter of intent in the fall of 2017. The solicitation was published on October 31, with a well-attended information session on November 14th. By the January 18th deadline (extended from the original December 21st deadline), the county had received only two bids, from Lake Union Partners and Stellar Holdings. The county didn’t provide any specific timeline for when it would complete its evaluation and select a qualified bid (assuming at least one bid meets the requirements). As the RFP makes clear, developing on public property is complicated. The County wanted to develop the property in two phases, on subdivisions of the available property. 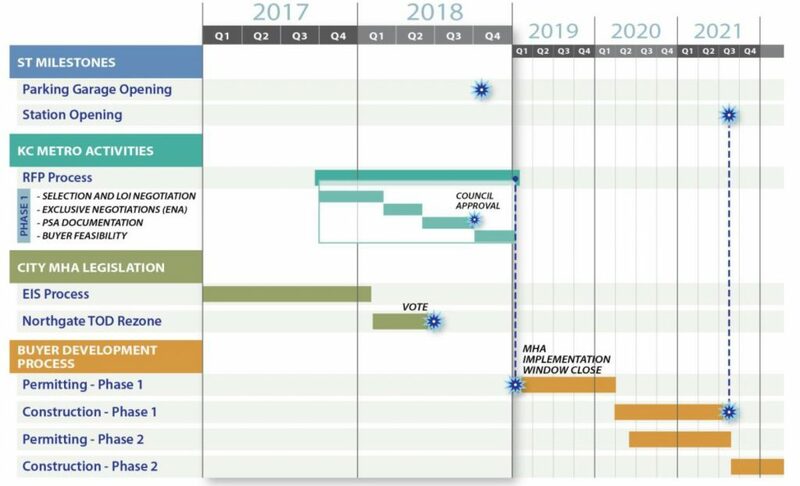 It hoped that phase 1 would be complete in time for the opening of the light rail station in 2021, and phase 2 becoming available for development shortly after phase 1 completes. However, Simon Properties, the company that owns Northgate Mall, has a “right of first refusal” on most of the property designated for phase 2. Simon recently announced that they were planning a major redevelopment of the mall, shrinking the retail space and “building up” to add commercial and possibly residential space. Like many other local governments in Washington, King County is subject to laws that constrain its ability to sell or lease property at less than fair market value, lend its credit, or subsidize private development. In addition, because the property at the Northgate ETOD site is owned by King County Metro Transit, it is subject to King County Charter Section 230.10.10. That section establishes the transit fund as an “enterprise fund,” which in turn means that transit property may be used only for transit purposes. As a result, when enterprise fund resources like transit property are used for nonenterprise fund purposes the enterprise fund must be made whole. Proposers should be aware of this context as they prepare their proposal, and should anticipate entering into an agreement to purchase or lease Metro transit property from King County at or above the fair market value of the property. At a minimum, Metro Transit must receive appraised fair market value when selling property. If the transaction is a sale, it must meet or exceed the appraisal of current fair market value, as determined by King County. Land next to a major shopping mall and a new light-rail station is very valuable, but the law required any developer who wished to lease or purchase it from the county to pay fair-market value. That makes it far more difficult to get the economics of an affordable-housing project to pencil out. But there is good news: in March the state legislature passed a law (HB 2382) that allows county and municipal governments to give away land, or sell it at a discounted rate, for the purpose of a “public benefit” — defined as the creation of affordable targeted at people with incomes at 80% of AMI or less. The intent was to solve the very problem described above, empowering local governments to provide a strong economic incentive for affordable housing projects.